Seven weeks and one day – that’s how long I had been sick. I caught a bug in August, which then weakened my immune system, causing me to pick up every virus in a 100-mile radius. Or at least that’s how it felt. Q: Is this punishment for something I’ve done wrong? Do I need to ask for forgiveness? Q: Do I need to extend forgiveness to someone else? Q: Have I fallen outside of your grace because I moved too fast on something and failed to seek your will? Q: Is this a spiritual attack from the enemy? Q: OK, then what is it? Please, just tell me so I can fix it, because I don’t think I can take much more of this. A: Do you notice how focused you are on what you “do” – if you’re doing enough of something or doing it the right way? Don’t you realize that I would love you if you never wrote another word or did anything else in My Name? In fact, if you never get out of that bed, I would still love you the same as I do now. It was like a rush of wind as God’s thoughts spoke clearly to my spirit. I knew in my head that God had loved me when I was dead in sin. I knew that I was saved because of Jesus’ sacrifice, not because of anything I had ever done. But somehow I think I had begun to do things in God’s name that I subconsciously believed would make Him love me more. God continued to minister to me with wave upon wave of love and understanding. I even thought about all the disabled people who can’t walk or speak – “vegetables” as they are often called. I felt God’s love for them. It was a beautiful illustration that the love God has for us is based on Him, not on what we can do for Him. We will never know what sweet communion these souls have with God. In the middle of these thoughts, I was startled as my cat Sue jumped on the bed. But when I opened my eyes, she wasn’t there. I felt peace and calm, and I knew that my guardian angel had settled down next to me. “I am here with you. I am always here, and I always love you.” My frustration (ok, my little breakdown) had ended, and I quickly fell asleep under the watchful eyes of my angel. “There are multitudes of men and women whose zeal for the Lord is likewise based on an attempt to atone for sin failure, or irresponsibility in other areas of their lives. But all the sacrifices in the world will not atone for even our smallest failure. To even make such an attempt is an insult to the cross of Jesus, which is the only acceptable sacrifice to the Father for sin. When I read this, I realized that God was giving me a deeper understanding of what He had shown me the night before. I felt convicted that I had been subconsciously trying to earn God’s love. But God reminded me that He loves me because of who He is, not because of what I do. I knew this in my head, but it’s finally starting to sink into my heart. I also realized that, at times, I had even tried to earn the love of my family and friends. As a self-proclaimed Type-A personality, I tend to rate myself on what I’m doing. I feel like a better wife if I’ve made great meals and cleaned the house. I feel like a better employee if I’ve solved some problem or worked 110%. I feel like a better daughter, sister, and friend if I’ve gone above and beyond in some way or another. But over the past few weeks, I hadn’t been able to really cook or clean, much less go grocery shopping. Robby had stepped up to these tasks without hesitation, and he never complained or showed frustration. In fact, for the longest time, I was the frustrated one because I felt bad that he was having to shoulder so much for so long. Now, I realize God was showing me that Robby loves me no matter what, thick or thin, whether I’m a domestic diva or domestic drop-out. Over the past few weeks, my illness has separated me from work, friends, family, and even my writing ministry. I now believe God allowed this time so I would STOP DOING and just BE STILL and KNOW – beyond a shadow of a doubt, and without any effort on my part – that God loves me and is with me. 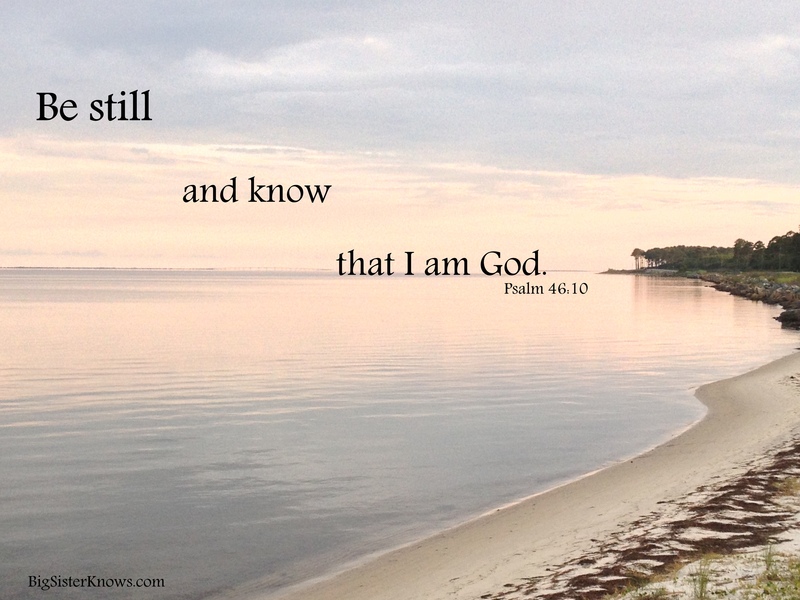 Psalm 46:10, NKJ Be still, and know that I am God; I will be exalted among the nations, I will be exalted in the earth! Physically, I’m feeling much better now. But each time I start to say, “I need to do this or that,” I make myself stop long enough to examine my motives. Am I trying to please God for His sake, or am I trying to earn His love? Am I trying to serve my family so I can be pleasing and helpful to them, or am I trying to earn their love? It’s a small difference, but what a different outlook! John 3:16, NAS “For God so loved the world, that He gave His only begotten Son, that whoever believes in Him shall not perish, but have eternal life. Romans 5:3-8, NAS And not only this, but we also exult in our tribulations, knowing that tribulation brings about perseverance; and perseverance, proven character; and proven character, hope; and hope does not disappoint, because the love of God has been poured out within our hearts through the Holy Spirit who was given to us. For while we were still helpless, at the right time Christ died for the ungodly. For one will hardly die for a righteous man; though perhaps for the good man someone would dare even to die. But God demonstrates His own love toward us, in that while we were yet sinners, Christ died for us. God loved us so much that He sent His Son to die for us – a perfect sacrifice as the perfect gift. How could we ever think that God could love us more than this? I am very happy to hear that you are feeling better, Ashley! 🙂 … It is wonderful to know that we are no longer in the old covenant of “earning” acceptance from God, but we are in the new covenant of “receiving” friendship with God. Thanks, Tami. You’re right – thank God for grace! So good to hear from you, Emily. As I’ve heard you say, God is good!